A Long Way Home! 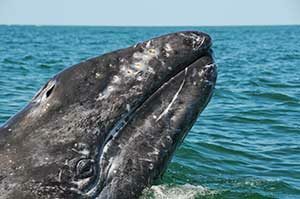 Gray whales migrate as much as 12,000 miles every year – from their summer feeding grounds in the Bering Sea down south to the warm waters of Baja California where they give birth in winter before returning back to the Bering Sea. Gray whales feed at the ocean bottom by turning on their sides, gulping in mud and water that they then push through their baleen to filter out food. Welcome back! They are a frequent visitor of Monterey Bay during their annual migration back north to the Bering Sea in the spring. Not all whales are friends! While traveling through Monterey Bay, Gray Whales tend to stay close to shore to avoid being the prey of killer whales, which try to separate the mother gray whales from their calves.